I am excited that tomorrow will be the end of our long voyage. We left Starbase 12 forty-two days ago. A week ago we stopped in the Japori system for a couple of days some much needed R&R, three days before that was a quick stop at Starbase 343 to pick up the last of my crew including key personnel such as my Executive Officer and Chief Engineer. Other than that the trip was mostly uneventful, twenty-four hours of Warp 6 every day does something to the nerves. Tomorrow we arrive in the Rho Puppis system, where our year-long mission is to provide a platform for extended scientific survey and scouting missions. With our sister ship, the USS Ada Lovelace, we are to thoroughly scan the system and the planets therein to ensured that there was no life in the system and that it will never naturally occur. We will start with Rho Puppis I, which is something of an anomaly, something in its atmosphere prevents surface scans from orbit. Then we will move on to Rho Puppis II: a desert world, probably Class H. The Ada Lovelace will start with Rho Puppis III, a Class J gas giant which has several Earth-sized moons to survey, then move on the asteroid belt between II and III. While the mission is exciting, I am not comfortable with the location. While we are twenty-some-odd light years from the Klingon border, we are only twelve light years away from the Romulan Neutral Zone. I realize there are at least six Starbases between us and them, but our closest neighbor, Starbase 324, is a day and a half away at maximum warp. I don't know what kind of colonist would want to live here after the terraforming crew is done but that will be thirty years from now, and probably out of my hands by then. Situated between the Dulisian, Angosia, Japori, and Jouret systems, nestled up against the Paulson Nebula, the Rho Puppis system would be prime real estate, if it didn't have such ill tempered neighbors. Satisfied with her log entry, Elizabeth Rouhani gently set the PADD on the side table, and tucked her feet up underneath herself. Holding her wine glass up, she looked over it out the viewport to see the purple nebula before her, and the bright star her ship was taking her to. The meeting with her senior officers at 0800 tomorrow would be another beginning, one she trully anticipated. Finishing the Chateau Margaux '26, she set the glass down next to the PADD and rose to look out the window. Standing feet shoulder width apart, and hands gently clasped behind her, she thought tomorrow could not come soon enough. Bruno, sensing the captain had gotten up, uncurled himself from the blanket where he had been sleeping at her feet, stretched, and walked over to join her. He looked at her, then out amongst the stars. Posted on 2018-10-22 at 12:00:34. Max is comfortable. Comfortable in the Big Chair next to the Really Big Chair, comfortable on his new ship, comfortable in his life as a Lieutenant Commander in Star Fleet. His rise through the ranks of various Ops departments made for an easy transition to the XO position and though he's only been on board for a week, he has already fallen into a comfortable, respectable pattern. With the new mission orders in hand and Starbase 343 in the wake of the big Nova Class—a ship that's so new, Lt. Cmdr. Cole has found himself making the same disastrous joke over and over again these past few days wherein he can see his own reflection in the carpet—the first officer of the USS George Washington Carver is finalizing preparation for their first fully attended staff meeting. Captain Rouhani had set the meet for 0800 and that meant that Max would get very little sleep before attending, let alone time in the morning to make sure all of the departments had their mission details and marching orders in hand for review before the debriefing. Pausing in his work long enough to look up at the central viewscreen, and subsequently the back of Ensign Soah's brown-haired head, Max considers his new captain in terms of how she might approach this upcoming meeting. Elizabeth Rouhani has proven herself to be about as even-keeled a person as anyone Maximus has ever encountered and he can't see her showing even a little excitement at the prospects their year-long mission present. Considering the many interactions he's had with her over the past week, he feels pretty confident that she'll be very matter-of-fact and all business; which means that her department heads had better have their ducks in a row. Dropping his eyes from the blurred starfield, the Starfleet officer returns them to the screen embedded in the smooth console separating the Captain's Chair from the First Officer's. He hasn't quite yet decided if he likes Captain Rouhani or if he's indifferent towards her. So far, all of their interactions have been the business of putting the Carver right and there's been little to none of a social nature. Stalling before pressing a command to bring up the latest Engineering report, Max wonders, I don't even know if she's married, has children, a family... I do like Bruno, though. Of that, I'm certain. Pressing the button, he begins scanning the information presented by the Chief of Engineering. A year is a long time, especially within the confines of a starship. The Carver is a large vessel as far as starships go, but eight decks are eight decks and though 263,160 cubic meters sounds like a lot of space... Max's experience aboard other vessels is that there will be a fair share of personnel issues within short order and having a Vulcan Ops officer will certainly make things all that much more interesting. Sure... let's put the unfeeling in charge of the masses. Okay... that's interesting... Engineering is reporting a problem with the gravity stabilizer on a portion of Deck 3 near the Transporter Buffer Compartment. New ships. Reading further in the report he compartmentalizes his thoughts and partially continues his internal dialogue. If truth be told, the jury's still out on his opinion of the crew in general. It takes some time to earn his trust and respect; definitely more time than a week. The Chief Tac Officer, Mister Thomas Stark, is very much a man of the file (Doesn't like the rank part)—Six hours! When was this report filed? Scanning back to the top of the digital document, Max registers the time. Should be coming up on completing that repair. "Cole to Engineering," he intones. "Please report on the situation on Deck 3." "Understood. Let's make sure that whole thing is put to bed before the captain rises from hers. Thank you." Turning his attention to the Asst. Chief Operations Officer manning the forward Ops station, Max orders, "If necessary, please make sure that Engineering has access to whatever replicator patterns they need and the resources to make the repairs happen cleanly." The order is most likely unnecessary, but Max is a detail-oriented individual and just because someone holds rank and position doesn't always mean they've earned it. Where was I? Oh, ya. Stark. The man seems to take issue with officers in general from what Max has noticed. But how he would get along with the Vulcan, Siric, was yet to be tried. Let's just hope that we don't have to find that out in the heat of things. Setting the Engineering report aside (figuratively), Max pulls up his message center and sends a quick reminder to Lt. Stark. Consider a collaborative report with other department heads for off priority scenarios. These odd situations should be accounted for in all departments and should include Security especially within Science and Engineering. I've read about and seen far too many anomalies that occur to dismiss the possibility. Obviously, we cannot predict the future but must concern ourselves with preparation and readiness all the same. If you have time, the report would be handy to have for the staff meeting tomorrow morning. Rereading the missive, he considers the necessity for such an order and decides on better being safe than sorry. Perhaps, with the pending staff meeting, the senior officers are all awake at this hour working on their various reports. Sending the suggestion, the XO pulls up the Engineering report again, finishing it in short order and only momentarily considering the hiccups the crew has experienced thus far and what might be waiting for them so close to enemy space. Science vessels strolling through Federation Wilds. What could go wrong? At least one of those vessels is captained by a scientist and likely both are. Max has already been witness to the influence Lieutenant Roseangela McGinty has in regards to the Carver and is making no mistake about the priorities of the ship. Science first and foremost with all other considerations relegated to afterthoughts and afterthoughts are his responsibility. Roseangela is a nice woman. Kind, generous with her care, and an easy ear for those prone to such a thing. Cole has heard nothing but positive from the crew that he's caught gossiping. Again, he hasn't spent a good deal of time with her so everything he understands is circumspect. I've got to admit, he muses, I've not really taken the time to get to know the rest. I should have but I've just been so damn busy. There are still so many among the officers and crew that he needs to get to know; so many personnel files to review. Four and a half hours left. Let's see what I can get through tonight. Posted on 2018-10-24 at 17:03:30. Roseangela was just back to the Sciences Station on the bridge after a bit of troubleshooting in the main Sciences Lab for Astrophysics. A typo in a formulaic equation programmed into a scanning field on a project imported from the station last week had caused the unusual growth of a mineral not usually found on the type of meteor being studied in the imported unit and that mineral was skewing much of the subsequent data related to several projects at once. It had been discovered by a brand new ensign, Ensign Tiaghen, and Roseangela had gone down there to check on it and help her team come up with a way to change the outcome of this project more favourably. She'd found the flub in the formula and they were able to adjust the field on the other samples, preserving the project as a whole. McGinty also suggested studying the anomalous sample separately as well. It was a curious result to the formula mistake. She was curious if the mineral had value in any way. If it did, learning how to grow it on common space rocks could be handy knowledge. Back at her station, she quickly narrated her report on this situation into a recorder which also created transcriptions for Starfleet reports at the same time she explained the situation to the Commander. "...so, Sir, the meteor chunk we'd grown the mineral on is now involved in a separate, independent study, if that's fine with you." She finished. Standing formally at her station as she awaited his reaction to her explanation for her brief absence from the bridge during her shift there, she couldn't shake the sense of wonder she still felt at actually getting this great assignment. She'd always done well on Science teams in her two previous Starship roles on both The U.S.S. Erudite and The U.S.S. Hawking, but this was her first time in the role of Chief Science Officer, head of the department for a ship. She didn't want to make a bad impression. Posted on 2018-10-25 at 05:02:35. Jenna exited the turbolift onto the Bridge, looking around. There was a certain thrill in entering a new bridge for the first time. She looked around, checking out her surroundings and the look of the bridge itself. A different setup, to be sure, but one she was looking forward to. Her friends and previous crewmates had thought she was crazy to not only take a position on a Science vessel, but to *request* it. They had no idea of what it was like, to be at the helm of a starship, to feel the ship moving under you, well, not really, and to respond to your very touch. And to be at the helm of a new, experimental ship, was exactly the kind of challenge she was looking for. She moved over to look at the Helm, to see the panels she would be working with, and the seat she'd be in. She was suddenly of a presence behind her, and she slowly turned to see Commander Cole sitting in the XO seat. She snapped off a quick salute. "Sir, sorry, sir! I didn't realize you were sitting there. Lieutenant Falcone, reporting, sir." Way to go, Falcone. she thought. Great first impression. "I was just checking out my new station, sir. I'm greatly looking forward to being at the helm of the George Washington Carver, sir." "Actually sir, I requested this assignment. I am greatly looking forward to the challenge of being at her helm. I've flown everything from shuttles to Steamrunners. This is new, and experimental. I really am excited." She paused. "If you will excuse me sir, I'll take my leave and settle in before fully getting underway." Jenna walked to the lift and stepped in. "Deck Two." she said, and breathed a sigh of relief. Hopefully the impression tomorrow will be better. she thought, as she headed to her quarters. "So that was my introduction to the GWC." Jenna said to the crew sitting around the poker table. "Fortunately Commander Cole saw it as new crew syndrome." She chuckled. "Come on Lieutenant." Ofan Soah, her SIC said. "There's no way." The lieutenant wasn't as military strict off duty as some, but she was solidly by the book. "Oh yes." Jenna replied with a grin. "By the way, full house." She set her cards on the table. The others groaned. "How do you do that?" Kieran Brada, one of the shuttle pilots asked. "Practice. That and entertainment. This trip has been one long haul. And we haven't even started yet. It's been all I can do not to fall asleep at the Helm. You don't need to tell anyone I said that." She stood up, sweeping the chips into a drawer. "Tell you what. Next R&R we get, the drinks are on me. I have to do something with all the money I've won from you." They threw their cards at her. "I'll expect those to be cleared up by morning, Mister." she said. "Command meeting tomorrow, folks. As soon as I know what's what, I'll hand out your assignments. Until then." They bid her good night, and she left the lounge, heading to her quarters. A good bunch. They'll do all right. She thought, letting down her white hair from the braid she kept it in. Just this side of official length, but still within standards. She'd received a lot of comments about it, not always favorable, but it didn't matter. It just was white. Not even age white, but white, like you'd see on the characters of a PADD, or paint. It was what it was, and it didn't distract her from her job, or others from theirs. She reached her quarters, grabbed a glass of water and then a quick shower, before heading to bed. She set her wakeup alarm for 0600, and prepared to sleep. Rao Puppis, here we come. She looked forward to being the one piloting the big Nova ship, and the smile on her face as she fell asleep showed it. Posted on 2018-10-26 at 14:25:21. Crewman Sari Uhnari sat at a computer console in the Mulipurpose Lab #1 and furrowed her brow over what she saw on the screen. She was conducting a experiment on a cell from a possible nucleogenic lifeform by subjecting it to polaron radiation to see if it would react. So far, she had gotten no reaction, but she was sure she was onto something here. After a few more minutes she sighed, and decided to call it a night, besides her stomach was telling her that she had skipped lunch and it was dinner time. She cleared the screen, and took the cell sample container from the test chamber and returned it to the storage/containment unit. Leaving the lab, she wandered down the hallway of the unfamiliar ship. 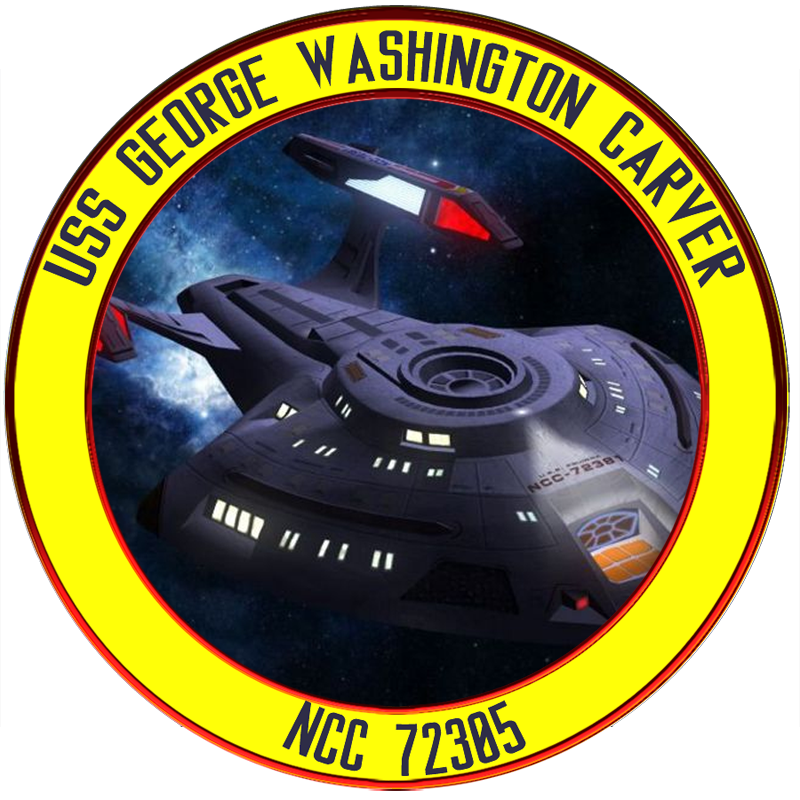 She had only been aboard about a week, having boarded at Star Base 343, so she was still learning her way around the USS George Washington Carver. She knew the location of her lab, her quarters, the mess hall, and of course, the gym. She still felt out of place and all of the strangeness of the ship, and the unfamiliarity with all the other species aboard. She couldn't help but wonder, Did I make the right decision in joining Starfleet? Reaching the turbolift, she stepped in when the door opened and was kind of glad that it was empty. “Deck 2” she said with a sigh. Sari wasn't about a lot of things yet; she didn't know if the Chief Science Officer liked her or not? She didn't know if the other crewmen with whom she shared her quarters with liked her? There were a lot of things she was unsure of right now. Being a minor empath, she often got 'feelings' when she was close to other people. Oh, she couldn't read minds, she only senses feelings and then only when she was in close proximity to another person; but what she sensed, made her feel uncomfortable, or better yet, unsure of her place here. Of course, maybe it's all in 'my' head. “Maybe I should have stayed at home in the restaurant,” she muttered with a faint smile. She could have worked in her parents restaurant and eventually she would probably take over the place if, and when, they decided to retire. While she was a pretty good cook, of Haliian dishes, she just didn't feel like cooking was what she wanted to do with her life. She loved science and wanted to pursue the passion and hoped she could do good here, but time would tell. The turbolift door opened with a 'whish' and it startled her back to the moment. Exiting, she walked down the hall and entered the Mess hall. She ordered some food from the replicator, which was a challenge in itself. Apparently the replicator didn't have any Haliian dishes in it's database, so she had to settle for human food. She had learned to cope when in basic training; though she had found some Vulcan dishes to be close to home cooking. Taking her tray to an empty table, she sat and looked around and didn't spot anyone she knew among the few people here. She sat down and began to pick at her food, eating a little and then slowly, trying to adjust her taste to unfamiliar tastes and textures. Like most things in her live lately, she would learn to adapt to the strange and yet intriguing atmosphere of the ship. Posted on 2018-10-26 at 18:42:28. With a small sniff, Kurt pushed his glasses back up to the bridge of his nose. In front of him the stood open the doors to the Transporter Buffer room where loose objects all seemed to be stacked against a wall. Well, technically the had fallen against the wall. Tilting his head slightly to the right, he extended his arm through the doorway and dropped the tin cup he was holding. It really was fascinating watching it shoot to the right to bounce off of the stack of objects. "So," he said, stepping back from the doorway and turning to the individuals standing beside him. "Vhat do you hafe in mind?" Standing in front of him where three individuals, all in the Starfleet yellow that indicated their belonging to the Engineering Department. Standing on the left was his Assistant Chief Engineer, Dolia. A rather tall - well, taller then Kurt, at least - Zaldan, as indicated by her webbed fingers, she had short cut, black hair and a tight, slightly frowning mouth. In the 12 days that Kurt had been aboard he had found her to be a determinded worker, something that he approved of. To her left stood Crewman Kai Kahale, the department's Life Support and Environmental Systems specialist. A large Polynesian individual, he dwarfed the officer to his right, and seemed to be made of solid muscle. If Kurt was to be honest with himself, he often forgot the man existed. The final man of the three was Master Chief Thomas Anderson. The Propulsion Specialist aboard, he had more years in Starfleet under his belt then many in the department had alive. He had a hard, weathered face with short cut gray hair. The feature that always drew Kurts eye, though, was the bushy gray moustache on his upper lip. If Kurt wasn't carefull, he'd often find himself talking to the moustache instead of the individual. The three of them exchanged glances, and Kurt realized he had interrupted them in the middle of explaining what exactly they had in mind. Adjusting his glasses again, Kurt cleared his throat and said, "From tse beginning, now." "Well, sir," Ensign Dolia replied, frowning slightly. "After conferring with Master Chief Anderson and Crewman Kahale it has been determined that in order to perform repairs on the Warp Field Compensator we will likely have to drop to impulse power." "Ah, I see." Kurt tilted his head to the left again and rubbed his chin. "Tsat is rather problematic, vouldn't you say? Crewman Kahale, how long do you expect tse repairs to take?" "Sir, unless the Compensator is completely shot and requires a completely new replication it shouldn't take more then a hour to replace affected components." "This is Ensign Dolia, go ahead." -- design output for the Generators again? 1500 MW? No, 1475 MW! Yes that was it. Replacing his glasses on his nose, Kurt stuck his tongue in his teeth. Well, what would the required Plating output be to generate enough of a field in the above compartment that personnel could safely enter? Perhaps 2.2 g's? He would have to math it out to be sure, but it couldn't be more then 2.5 g's and that shouldn't draw more then 350 MW from the Generator. Normal loading for full ship gravity would be about 927 MW if he remembered correctly. This should work. "Sir, it appears that the Warp Field Compensator has malfunctioned. In order to enter the compartment to make repairs, we will likely have to drop out of warp. It shouldn't take more than a--"
"Actually, sir," Kurt broke in, looking up to the ceiling. "Tsere may be another option. You see, the Varp Field Compensator is in fact tse problem component. Tsey are a new design, vorking off of tse feedback from tse varp field itself to compensate for tse odd gravitational effects tsat being in varp has on tse compartments. It is a vonderful tseory, quite interesting und vith a few minor adjustments to tse Compensator output gains I expect tsat it vill likely not happen again. However, by moving avay from tse old systems vich used tse detected varp field to compensate power distribution from tse generator itself, ve find tsat it provides us vith a new variety of problems. Such as--"
"Sir!" Ensign Dolia said, stepping forward slightly. "This other solution?" "Ah, ja." Kurt tilted his slightly, looking at the three Engineering personnel in front of him. "Vell, if ve vere to secure gravity to tse compartment altogether und compensate using the Gravity Plates in tse deck below, I believe ve vill be able to enter the compartment and complete tse repairs vhile remaining at varp. I still have to do some calculations to get tse actuall values ve vould have to input und compensate for, but, Commander, I believe tsat it is fery achievable." "Sir!" Master Chief Anderson growled, almost clipping off the end of the XO's reply. "The power required to raise the gravitational field below deck would be extensive. It could easily overstrain the Generator. I'm sure, sir, that I don't need to remind you that that would result in shipwide loss of gravity." "I understand your concern, Master Chief." Kurt replied, adjusting his glasses so they sat properly on his face and accidently smudging the lense in the process. "However, I believe tsat tse calculations tsat myself and Ensign Dolia shall complete vill find tsat the generator is capable of handling tse excess load." "Respectfully, sir," Crewman Kahale spoke up, following as Kurt began to walk down the passageway. "The generator already operates near to eighty five percent our normal operation limit. I am worried that increasing the load will put us past that." "Tsat limit is an extremely conservative estimate, tse generator is rated for power usage almost 200 MW more tsen vhat I estimate tse final loading to be. I vill have a more accurate number for you in about 15 minutes. Now, Crewman Kahale, you are to go to tse compartment below und clear all personnel und equipment tsat may be damaged by tse increased gravitation field tsen return here. Master Chief Anderson, you are to assemble Crewman Jackson. Breif her on tse plan und have her ready to assist Crewman Kahale on tse repairs. Ve vill have tsis done and over vith in less tsan an hour. Come, Ensign, ve hafe some maths to do." Posted on 2018-10-27 at 15:18:47. Max is comfortable. Comfortable in the Big Chair next to the Really Big Chair, comfortable on his new ship, comfortable in his life as a Lieutenant Commander in Star Fleet. His rise through the ranks of various Ops departments made for an easy transition to the XO position and though he's only been on board for a week, he has already fallen into a comfortable, respectable pattern. With the new mission orders in hand and Starbase 343 in the wake of the big Nova Class—a ship that's so new, Lt. Cmdr. Cole has found himself making the same disastrous joke over and over again these past few days wherein he can see his own reflection in the carpet—the first officer of the USS George Washington Carver is finalizing preparation for their first fully attended staff meeting. Captain Rouhani had set the meet for 08:00 and that meant that Max would get very little sleep before attending, let alone time in the morning to make sure all of the departments had their mission details and marching orders in hand for review before the debriefing. If truth be told, the jury's still out on his opinion of the crew in general. It takes some time to earn his trust and respect; definitely more time than a week. The Chief Tac Officer, Mister “Raz” Stark, is certainly a different breed. Half Terran, half Klingon. I don't even want to know how that happened. Don't Klingons have two—Six hours! When was this report filed? Scanning back to the top of the digital document, Max registers the time. Should be coming up on completing that repair. "Understood. Let's make sure that whole thing is put to bed before the captain rises from hers. Thank you." It looks as though we have an engineer. Good. The order is most likely unnecessary, but Max is a detail-oriented individual and just because someone holds a rank and position doesn't always mean they've earned it. Where was I? Oh, ya. Raz. The woman seems fairly uncharacteristically calm for a Klingon. Maybe she takes after her mother... or father... which one was the Human again? But how she would get along with the Vulcan, Siric, was yet to be tried. Let's just hope that we don't have to find that out in the heat of things. Rereading the missive, he considers the necessity for such an order and decides on better being safe than sorry. Sending it, the XO pulls up the Engineering report again, finishing it in short order and only momentarily considering the hiccups the crew has experienced thus far and what might be waiting for them so close to enemy space. The barely audible hiss of hydraulics draws Maximus’ attention over his shoulder to the lift where Roseangela strides back towards the Sciences Station on the bridge after having earlier asked permission to see to a developing problem in her department. Looking askance of her, the XO waits as she approaches and begins to describe the typo in a formulaic equation programmed into a scanning field on a project imported from the station last week. This one formulaic error has caused the unusual growth of a mineral not usually found on the type of meteor being studied in the imported unit and that mineral was skewing much of the subsequent data related to several projects at once. She proceeds to explain that the growth was discovered by a brand new ensign, Ensign Tiaghen, and Roseangela had gone down there to check on it and help her team come up with a way to change the outcome of this project. She'd found the flub in the formula and they were able to adjust the field on the other samples, preserving the project as a whole. McGinty also suggested studying the anomalous sample separately as well. She was curious if the mineral had value in any way. If it does, learning how to grow it on common space rocks could be handy knowledge. "...so, Sir, the meteor chunk we'd grown the mineral on is now involved in a separate, independent study, if that's fine with you." She finishes. Standing formally at her station, she awaits his reaction to her explanation for her brief absence from the bridge during her shift there, she can’t shake the sense of wonder she still feels at actually getting this great assignment. She's always done well on Science teams in her two previous Starship roles on both The U.S.S. Erudite and The U.S.S. Hawking, but this is her first time in the role of Chief Science Officer, head of the department for a ship. She doesn’t want to make a bad impression. Turning away from the woman who is now involved in making her recorded report, Commander Cole begins to review the mission specs and instructions from his captain. He’s aware that she may want to change up shift command and finds that intriguing as he’s never served on a ship where the CO and XO worked the same shift. He’s very interested in the results of tomorrow’s meeting. Posted on 2018-10-28 at 20:36:01. The incoming message indicator wouldn't be ignored any longer, so Tom opened the missive. Commander Cole wanted what amounted to a joint threat assessment report with Engineering and Science. That was well and good, and made plenty of sense. But how, exactly, did the Commander expect a joint effort to be completed in time for a morning staff meeting when he made the effing request the NIGHT before? Safe in the confines of his own cabin, Tom unleashed a litany of curses directed at the request itself, officers in general, and Commander Cole the Hinge in particular. It didn't matter where in the Fleet one found themselves, BOHICA was simply going to be the standard order of the day from the Cake Eaters. Somewhere in the middle of his tirade, Tom found himself chuckling at the absurdity of railing against the Cake Eaters, considering that he was one, himself... had been now for three years. Fifteen years of good service enlisted in Starfleet, all the way to rating as Senior Chief, only to start over as a damn Ensign after he'd bought into the nonsense that the CTO and Captain of the USS Jericho had been selling. But at least he hadn't been a true Zero. With the real world experience he brought to the table, Tom had been far more useful than some hotshot Academy grad. He had the skills, he had the know how; now, he enjoyed a bigger cabin, a bigger paycheck, and a place significantly higher up the food chain than he had ever known. Hell, he might curse the replicator, but it hadn't been that long ago that he'd have had to hoof it to the Crew Mess to get chow... let alone be able to enjoy it in his own private quarters. So, all told, Tom had a good life. Even if he was stuck on a Science and Survey boat, where the most action he'd likely see would be from someone tripping over their equipment or leaving some pencil neck device on for too long. Ah, well. It definitely beat drilling the Menden rock for the next twenty years, that was for sure. So he grabbed a PADD and started a response. I am already working on some threat assessments and contingency plans, as well as considerations for proper security of our survey and scientific teams, and for our vessel in general. I will be happy to put together the joint report that you are requesting, but I must regretfully bring to your attention the fact that there simply will not be enough time to complete the requested report prior to the morning's staff meeting unless you choose to order Lieutenants McGinty and Wilhelm to put in some late hours tonight. Would it be acceptable if I were to present a few bullet points in the morning, and to coordinate with Engineering and Science as a take away assignment after? Or will you need me to ask them to return to duty now, instead? The tone probably could have used a little more flowery language, but truth be told, Tom was proud of himself for deleting the reference to the "regretful lack of the Space/Time Continuum Editor necessary to complete these orders, SIR" (with the first letter of the "sir" pronounced as a "c"). Satisfied, the TAC hit "send" on the message, then turned back to see if he could figure out a way to coax the replicator into creating dishes with the correct vertical alignment. Posted on 2018-10-29 at 15:38:28. Bruno lays patiently outside the door to the conference room, his head perks up as senior officers file into the conference room, he licks palms if they are offered, but puts his head down on his forepaws when everyone is inside and closes his eyes waiting for the meeting to end. "Good morning," Captain Rouhani starts. "I hope everyone is well rested. Before we get started, a quick announcement: Captain Kerawa says the Ada Lovelace is going to be late. They had an issue on Deck 3 they couldn't resolve without taking the warp core offline. Due to complications, it's going to take them three days to put it all back together. They are planning on arriving on Thursday. Many thanks to you and your team Lieutenant Wilhelm." Rouhani nods to the end of the table. "As all of you know, our primary mission is to explore Rho Puppis, a previously uninhabitable system rich in dilithium. A terraforming crew is on its way to transform these planets and make them habitable for the colonists who will eventually mine and refine the rich dilithium deposits in the system. This is part of a longer-range plan. Admiral Hanson of Starbase 324 says the terraforming craft is on its way. Traveling at Warp 2 it'll take them 6 months to get here and we need to have a landing site mapped out for them by the time they arrive. We'll begin by exploring Rho Puppis I and figuring out why we've been unable to pick much of anything up without scans. "Lieutenant Siric, what do we know about Rao Puppis I?" The Vulcan COO sitting between the XO and the CTO states in a flat tone, "Captain, long range sensors indicate that Rho Puppis I is 1.12 earth sized, .98 earth mass, .87 earth solar rotation, and gravity is comparable. Sensors are only picking up the planet's gravitational pull, and cannot scant the planet itself. The Paulson Nebula is only 2.27 trillion kilometers away from the solar system, it is 82% dilithium hydroxyls, magnesium, and chromium, also making scanning, as well as warp penetration, nearly impossible. One oddity is that Rao Puppis I has a lunar wobble as if a satellite would affect the planet's tides. But there is no lunar satellite." "Thank you Lieutenant," Rouhani turned to her left to address the CSO. "Lieutenant McGinty, what else could cause a lunar wobble if not for a lunar satellite? What's the severity of the wobble? How could that affect conditions on the planet's surface?" "Very interesting, thank you, Lieutenant." Standing straighter and addressing the individuals in turn. "Lieutenant Siric, once we arrive I want you to perform some short-range scans to determine atmospheric conditions and weather patterns on the surface and gather data about them. Let's see what conditions an away team might have to contend with." "Thank you, Lieutenant." Turning to his neighbor, "Commander Cole can you start preparing an away team to gather more information about the surface once we get a handle on conditions down there? Lieutenant Siric, keep Commander Cole informed about what his people will be up against. "Lieutenant Wilhelm, once we arrive you'll be able to fully investigate the hiccups we've been experiencing. When the Ada Lovelace arrives, contact their Engineering officer to compare notes about these problems. Let's learn from each other. Get me a report of your findings as soon as you know what happened. "Lieutenant Falcone, I want a full inspection report of the Waverider. This is a brand-new atmospheric shuttle and we should know what it's capable of. I want to see a plan for short-range testing soon after we arrive. Let's see what she's capable of, shall we? Posted on 2018-10-29 at 16:54:11. Posted on 2018-10-30 at 07:28:49. The Captain is just like I'd heard. Jenna thought. Coffee and cake, and 0800 on the dot, all business. "We will arrive at Rao Puppis I in 3 hours, 17 minutes, 27 seconds." The Vulcan states. Going to have to remember to coordinate information with him after those scans. Jenna thought again. Got to know what I'm sending my pilot into. Three hours, huh? Not a problem. I'll have it done in two, two and a half tops. Jenna thought. She had a pretty good idea of her staff and knew they'd be solid. Eases the boredom. she thought with a chuckle. Posted on 2018-10-31 at 11:35:02. Cole reads over the response from Stark and shakes his head. If you can't get it done tonight, you can't get it done. Additionally, there's no reason to reply to the missive. Max has put a goal in front of the man and how he chooses to handle it is completely up to him. Tomorrow's meeting will show the results. Limitations are almost always self-imposed, Mr. Stark. "Bruno!" Max sweeps down to scratch the animal behind his ears and greets him warmly. He likes having a dog aboard; life feels a little more Terran around the Captain's pooch. "Good morning," Captain Rouhani starts once the pleasantries and snacks have been dug through. "I hope everyone is well rested. Before we get started, a quick announcement: Captain Kerawa says the Ada Lovelace is going to be late. They had an issue on Deck 3 they couldn't resolve without taking the warp core offline. Due to complications, it's going to take them three days to put it all back together. They are planning on arriving on Thursday. Many thanks to you and your team, Lieutenant Wilhelm." Rouhani nods to the end of the table and Cole follows suit. On both ships? Design flaw? Going to need to remember to get a copy of the Ada Lovelace's engineering log to compare to ours. "Thank you, Lieutenant." Turning to Maximus, she continues. "Commander Cole, can you start preparing an away team to gather more information about the surface once we get a handle on conditions down there? Lieutenant Siric, keep Commander Cole informed about what his people will be up against." Not feeling like he needs to say or do anything in response, Max follows her conversation with his eyes. "Aye, sir," Jenna replies. "It'll be ready." "That will depend on the short-range scans, Lieutenant Falcone," Cmdr. Cole answers for Captain Rouhani. "Provided that the scans work, they'll show us where we can set down and what kind of atmosphere we're to expect on the surface. From that data, we'll be able to extrapolate the correct entry angle and plot a trajectory for the Waverunner to the landing site. "I'll be putting the team together over the next three and a half hours, or so," Max continues. "I expect I'll need you, Lieutenant McGinty, you too Lieutenant Draci, and Lieutenant Stark as well. Lieutenant Falcone, of course, will pilot the Waverunner. Mister Stark, if you feel it proper, you can bring along another from your department. Lieutenant Wilhelm, please work with Lieutenant McGinty and put together teams for proper surface scans. We may need to set up multiple sites for science relays in order to get a detailed report and with as mysterious as Rho Puppis I has been thus far, I don't imagine we're going to find it much more welcoming on the surface so we'll want to make our initial stay as short as possible. Posted on 2018-10-31 at 16:54:24. Captain Rouhani gave her briefing of the situation and the mission, and handed out assignments to each of the senior staff. So it came as no surprise when she settled her attention on the wiry, brown-haired Chief Tactical Officer. "Lieutenant Stark, rumors on board tell me that drills have become too routine," she spoke. "Now's the time to shake things up. Come up with some new drills that stir things up a bit. We don't know what we'll encounter on the surface and we need to be prepared for anything." We've been on board this ship for next to no time, but the drills have become routine already? Stark wondered internally. Apparently, our egghead cruise has a surprisingly short attention span. Not that he could say that out loud, of course. Instead, he responded affirmatively. "Aye, sir. I have some ideas; I'll put together some proposals for you." If the Captain really wanted him to keep things interesting, Tom could oblige. As for being prepared for anything... yeah, experience said that it was tough to know what you didn't know; and thus, it could be tough to prepare for the unknown. "I'll be putting the team together over the next three and a half hours, or so," Cole continued. "I expect I'll need you, Lieutenant McGinty, you too Lieutenant Draci, and Lieutenant Stark as well. Lieutenant Falcone, of course, will pilot the Waverunner. Mister Stark, if you feel it proper, you can bring along another from your department." If I feel it proper? Is that naked sarcasm from the Hinge? Stark wondered. One the meeting was over, Tom double timed it to Security and located Ensign Kyu-Ri. The Korean woman kept a calm exterior, but the sparkle in her eyes betrayed her feelings. "Sir, I hear that the first AWAY team will be leaving soon. I was wondering..."
Tom frowned and shook his head. "I'm sorry, Raz, but I can't let you go on this one. Commander Cole has ordered me to be there, and this is a tiny ship. If it were bigger, we'd have more officers, but since it's just you and me... somebody has to be in charge. Don't worry, you'll get your chance." Kyu-Ri nodded with a bit of a dejected expression, but that softened as she considered Tom's words. "In charge? Me?" she asked, as if it were too good to be true. Tom grinned. "That is correct, Ensign. You will be the Tactical OIC while I'm off ship. I'm thinking that I'll bring Ben this time around. Take care of things while we're gone, you got me?" The Ensign snapped to attention. "Yes, sir! I've got this, sir!" Stark nodded. "I'm sure that you do, Raz, else I wouldn't leave you in charge. But remember - Senior Chief Wesson has forgotten more about this department than most of the other scrubs will ever learn. If you need a hand, take advantage of that experience." And listen up if he tells you something, Tom mentally added. Raz nodded. "Aye, sir. I will." Tom grinned again; he believed her. Posted on 2018-10-31 at 23:30:40. McGinty replied, "Off the top of my head, a high density low orbit satellite, or the planet has been struck my an asteroid, or a large object has passed within the vicinity pulling the planet very slightly off its axis. Looking at these readings, it's not a very severe wobble at all, it's equivalent of what Earth experiences with her moon. As for affecting lunar conditions, it'll make high tides higher and low tides lower assuming there's an ocean." "I'll be putting the team together over the next three and a half hours, or so," Max continues. "I expect I'll need you, Lieutenant McGinty, you too Lieutenant Draci, and Lieutenant Stark as well. Lieutenant Falcone, of course, will pilot the Waverunner. Mister Stark, if you feel it proper, you can bring along another from your department. Lieutenant Wilhelm, please work with Lieutenant McGinty and put together teams for proper surface scans. We may need to set up multiple sites for science relays in order to get a detailed report and with as mysterious as Rao Puppis I has been thus far, I don't imagine we're going to find it much more welcoming on the surface so we'll want to make our initial stay as short as possible. "Sir," McGinty pipes up, "I'm as anxious as anyone to get boots on the ground, but I'm also very excited about the meteor project I spoke to you of last night." I would recomend you take Ens. Tiaghen, her experience in exogeology will be invaluable. You'll also need a lab tech to collect samples, Crewman Uhnari is the best one I've got. Don't worry, I'll be done with this project before you know it and join you for a future away mission." Posted on 2018-11-01 at 10:18:47. "I hope to coordinate with Lieutenant Siric as soon as he has that data, Sir," Jenna answered. "It's your call, Sir. I just wanted to inform you of the details for the Waverider." She stood at ease, counting down the timeline from the Captain in her head. Posted on 2018-11-01 at 20:23:39.